in association with the Solomon Islands Planting Material Network, the provision of training and assistance in setting up and managing community-based seed and staple food crop planting material production/ distribution networks. Family farming sustains rural villagers in Melanesia. Increasing the sustainability of village farming is a core activity of the KGA. To further the goal of regional food security, Kastom Garden Association cooperates with community organisations, development agencies, agriculture departments, hospitals and health services, religious organisations, government and donors. 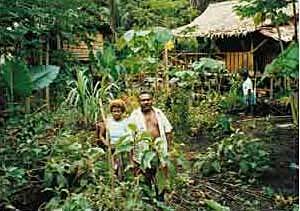 ‘Kastom Gaden’ is a Solomons Pijin language term meaning ‘customary gardening’. Kastom Gaden Association trainers combine useful elements of customary (traditional) food production with modern approaches to create an environmentally sustainable approach to small scale food production for villagers. The Kastom Gaden Association was created when the Kastom Garden Programme (KGP) ended in 2001. Kastom Gaden has fostered regional cooperation by extending their work into other areas of Melanesia and by developing a team of competent, experienced trainers. Kastom gaden now works through rural based partner organisations who are having their organisational ability strengthened through being part of this network.